While this document may be of more interest to O scale modelers, I thought I'd add it to my web site which usually features Sn3 projects. 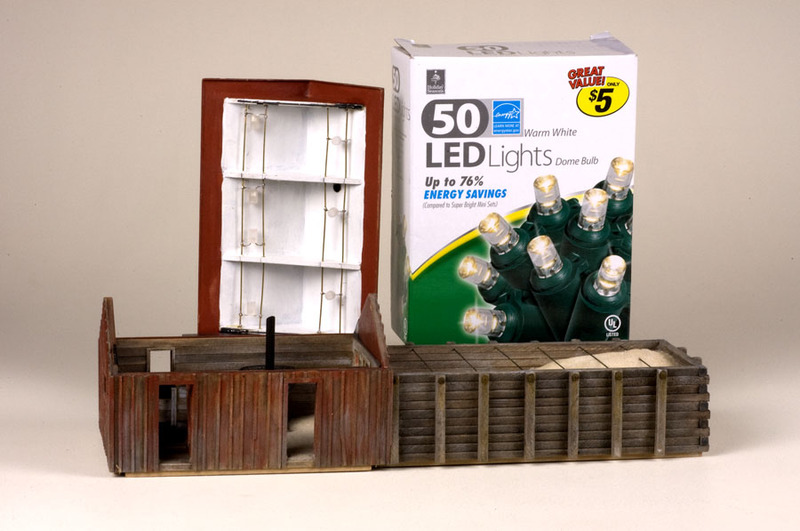 It features scratch building techniques and uses materials that can be applied to virtually all the modeling scales. The original version of this document appeared as an article in the December 2010 issue of Railroad Model Craftsman magazine. While that published article included several illustrations, this web page document features many that were not submitted or included in the printed version. Pictured above are two versions of the Ridgway Sand House. The foreground model is the S scale one taken from my layout. 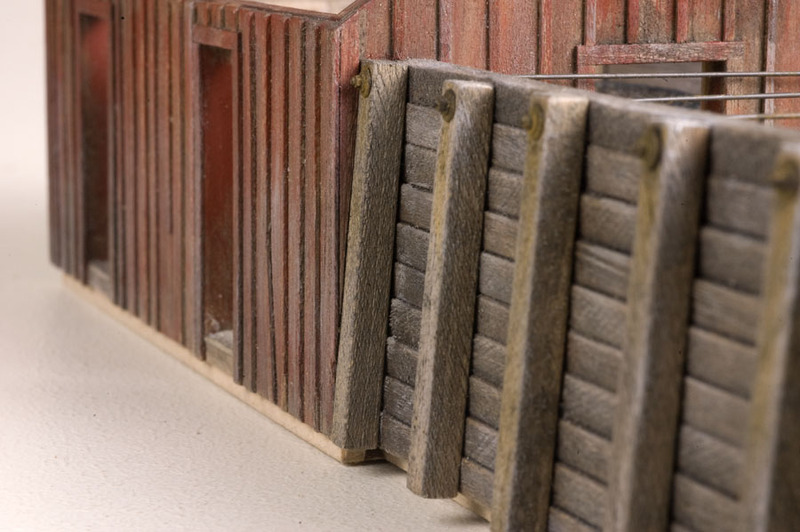 It is a slightly modified Banta Modelworks model and was used as a guide to scratchbuild the O scale model seen in the background. I must admit that I was surprised at how much larger O scale structures are when compared to their S scale counterparts. One of the first things I quickly noted working in the larger scale was the larger size of the strip wood. 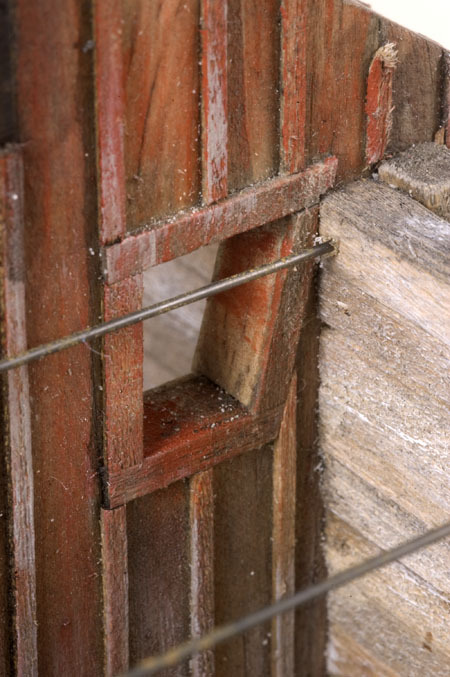 The square posts for the sand bunker cribbing were actually 1/4" square. 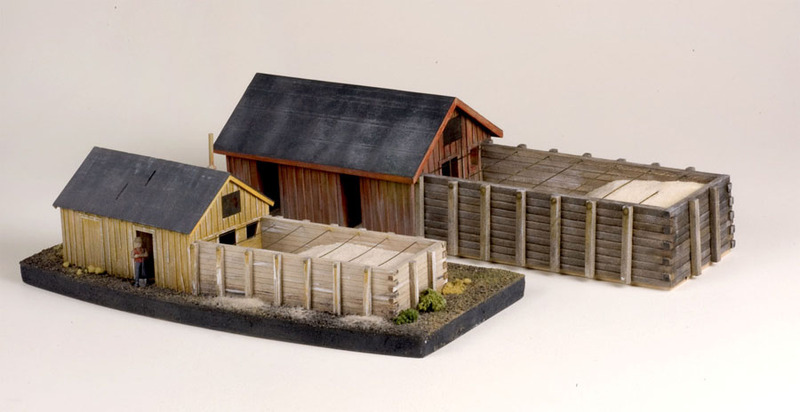 Their size helped make their angle set against the sand house wall more pronounced than they appeared on the smaller model. 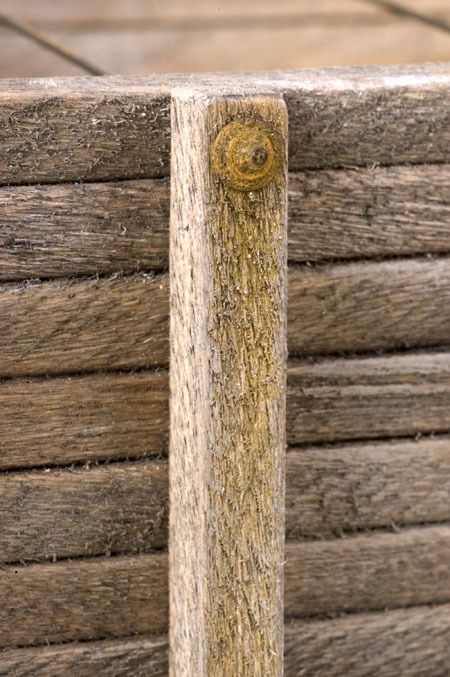 Holes were drilled through the top of the cribbing posts and top timbers and the tension rods made with chemically colored brass rods were carefully threaded through them. Grandt Line NBW castings were inserted into the holes drilled for the tension rods. Their rust coloring was created by carefully brushing them with my, "Sweet & Sour," rusting solution. 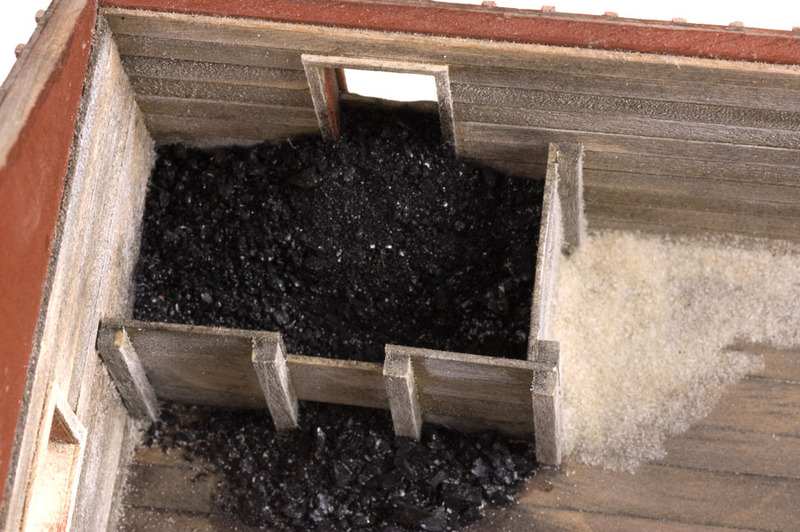 The outside wall had a window located just above a pile of coal so I simply designed an interior bin that would be close to and convenient for the sand house worker to shovel into the large sand driving stove. The exterior wall of the sand drying building that faced the sand bin had a uniquely shaped window through which the sand house worker could shovel sand into the building. It was shaped to take into account the worker swinging a heavy shovel full of sand in a wide arc over his shoulder and having most of it go through the window and into the building. The corner tool area consisted of two timber planks and some sand on the floor. 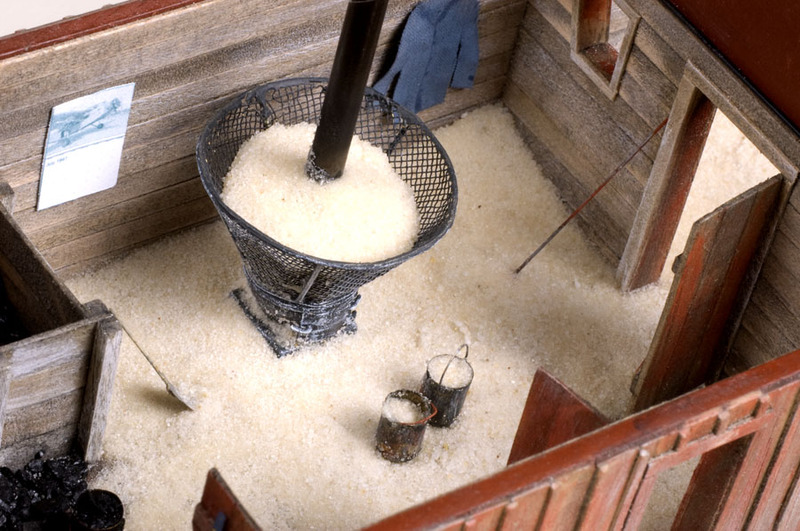 Shovels, picks to break up frozen snow and any other long handled tools were usually kept there. The sand drying stove involved some research to determine what one of these things actually looked like. A friend sent me a photo of the stove in the Durango sand house and I used it as a guide to build one for this building. The screen area represents a truncated cone. It took some involved calculations but through trial and error I was able to fabricate one out of brass screen that I found in the plumbing section of a hardware store. 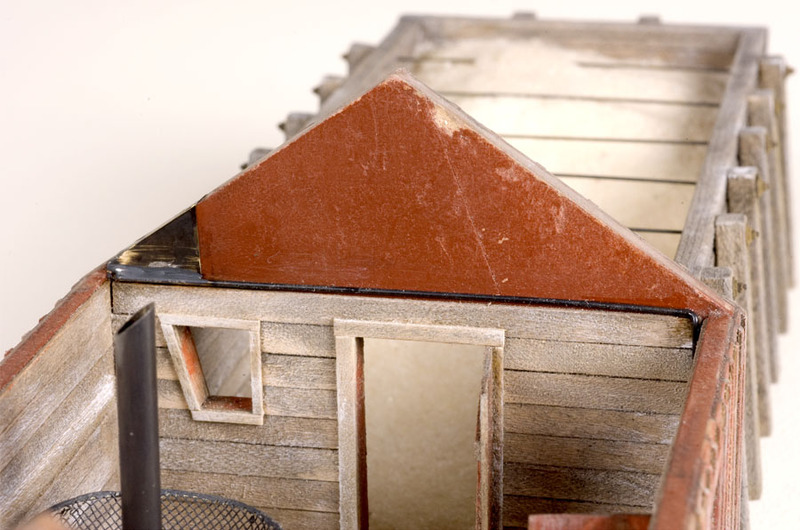 The stove is modeled after a large S scale engine house stove I had. Using its dimensions I came up with this O scale version which was made from a wooden dowel rod. 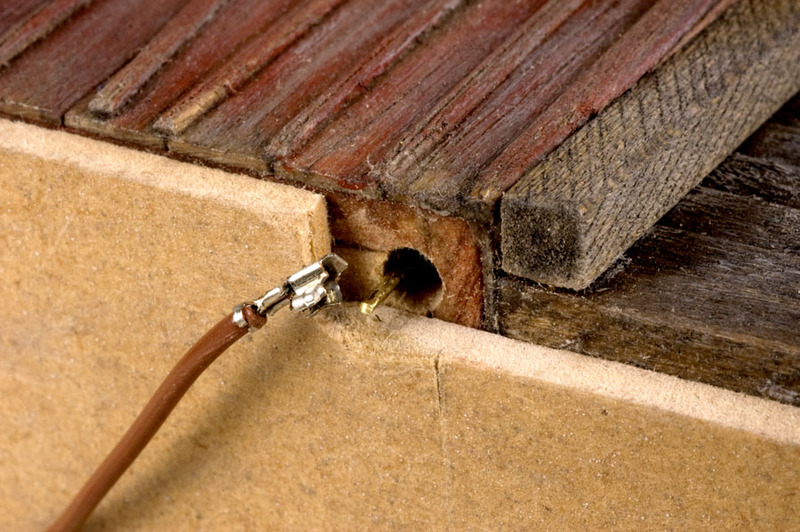 The base is a square piece of wood and the door to the fire box was made from pieces of brass wire and shim stock. 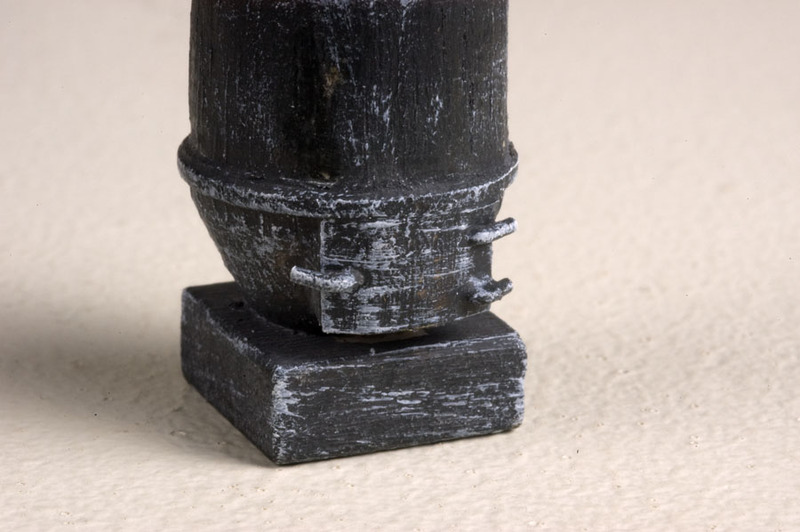 This close-up view shows the stove after it was painted grimy black and dry brushed with traces of white craft paint. 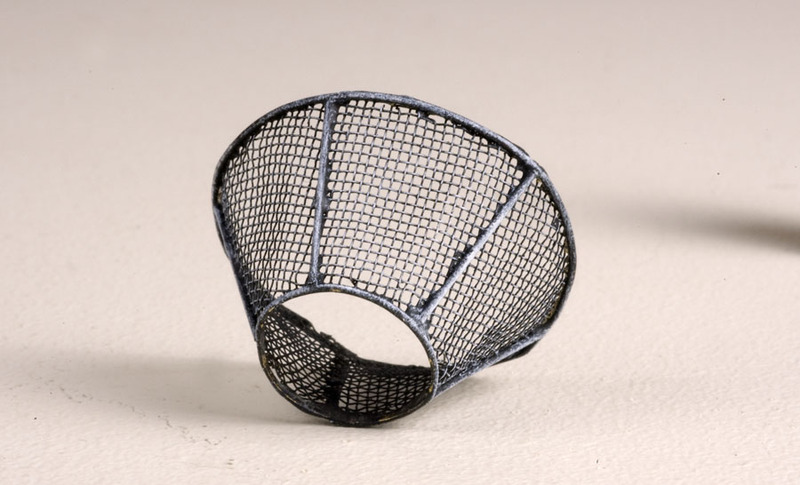 Here's a closer view of the sand drying basket. I designed a pattern for it on the computer and printed it out on index stock paper. 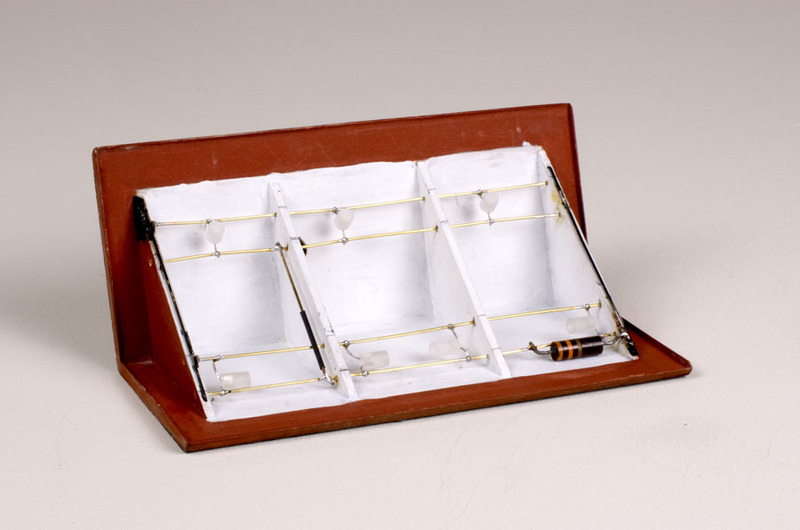 The brass screen and wire were soldered together while trying to hold everything in place on the drawing. When finished, it was painted with the Polly Scale Grimy Black paint. 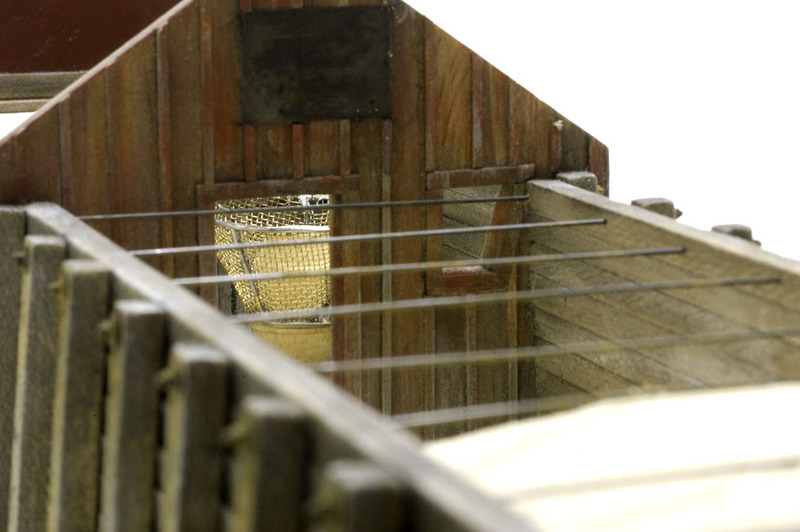 This view shows the drying basket and the stove. I wasn't too concerned with how the top of the stove looked because it would be covered with sand once both pieces were fitted together. 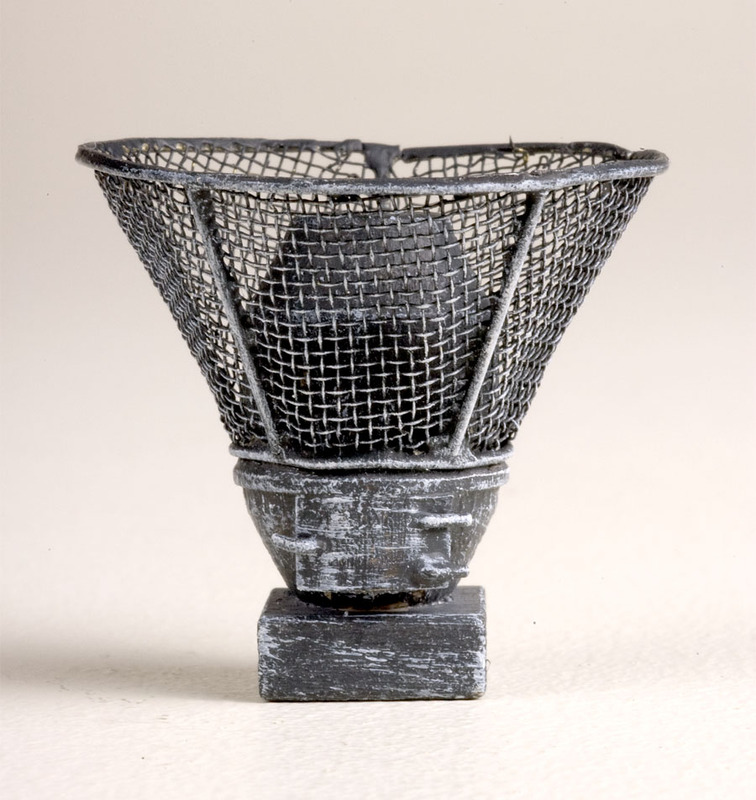 The lower ring of the drying basket was lowered onto the ledge surrounding the stove. While the screen was deformed while I was soldering it to the wire supports, I believe it ended up representing how the prototype must have looked after years of service. Here is the finished stove with it's drying basket in place and positioned in the drying house. 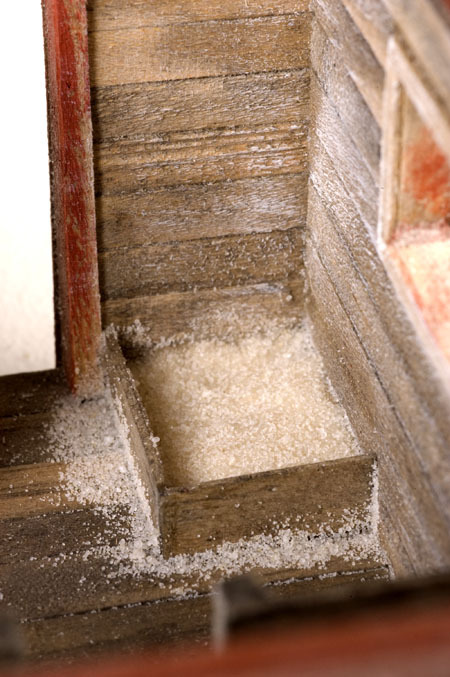 A small amount of sand was glued in place close to the point where the two components came together to hold them in place. More would be added later when the stove was finally located and glued to the floor. 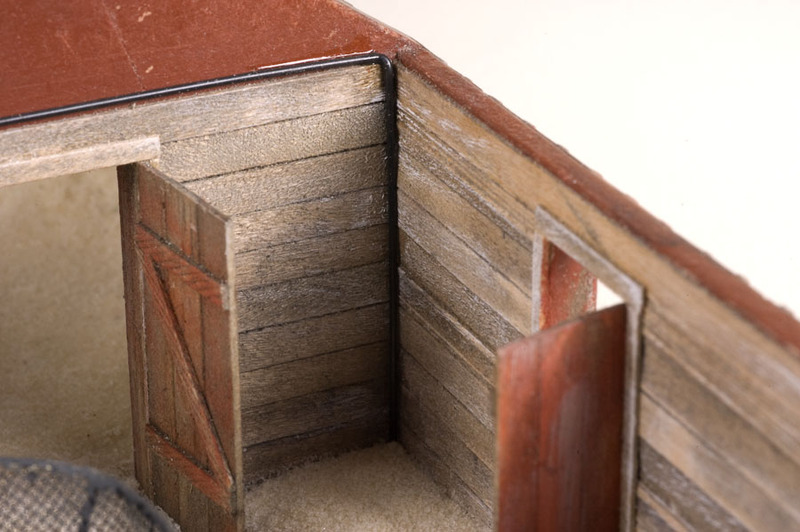 I decided to use Warm White LED's to illuminate the interior of the sand house rather than incandescent GOW lamps. They came from a string of GE Christmas lights that cost approximately $3.00 for a string of 50 bulbs. I liked the warm white color because it was very close to the appearance of incandescent bulbs and were easier for me to obtain. Brass wire was used to create wiring busses in the removable roof of the building. Rather than fitting each LED with it's own resistor, I decided to use a single 330 ohm one for the entire array. 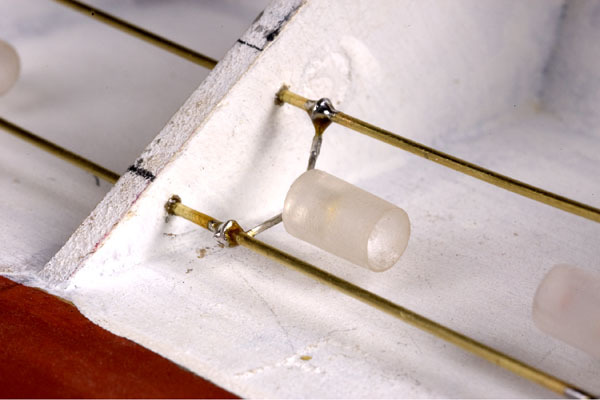 The surface of all the LED's in the building were scuffed up with a sanding stick before being soldered to the overhead busses. Because the LED's that were located over the rear portion of the building might be visible when viewed through the doors, I decided to reduce their length a bit. Prior to sanding their outer surface, I was able to carefully cut just above the internal LED components with a razor saw. Also, because they might be seen, they were oriented downward to appear as large bulbs. I doubt that the prototype building had any interior lighting, but I wanted to install some in my building. 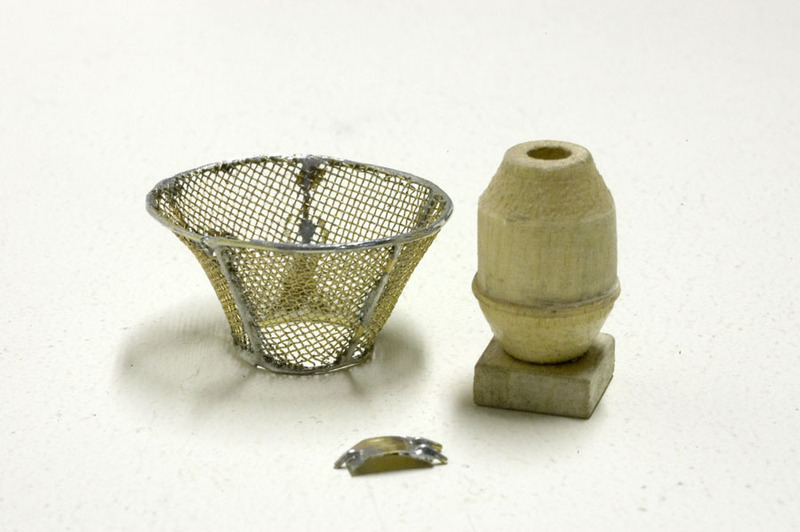 Brass wire was used to represent conduit and also as a way of getting electricity to the various overhead buss wires. It was painted with Polly Scale Grimy Black paint before being installed. The darkened conduit wires were routed toward the front wall and down through the floor where they could be connected to a power supply. Because the roof was removable, I needed a way to connect the power supply to the overhead buss wires. 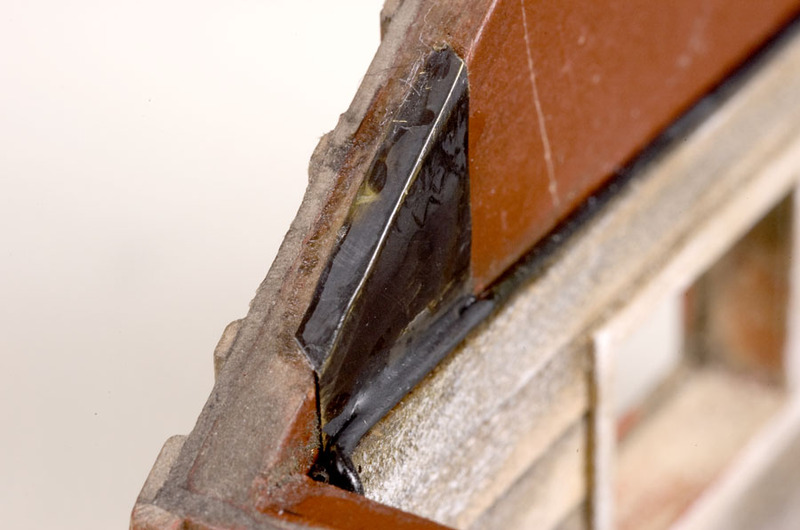 Small pieces of shim brass were chemically blackened, then epoxied in place at both ends of the inner faces of the end walls. 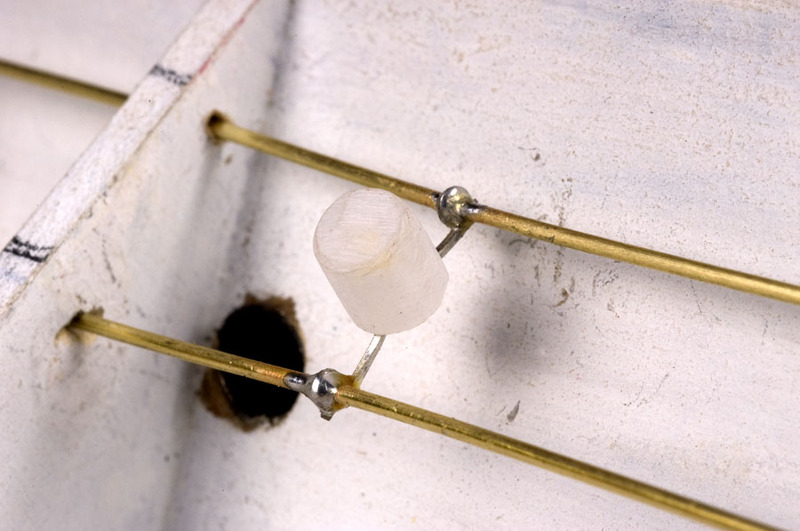 They were then soldered to the brass conduit wires installed earlier. 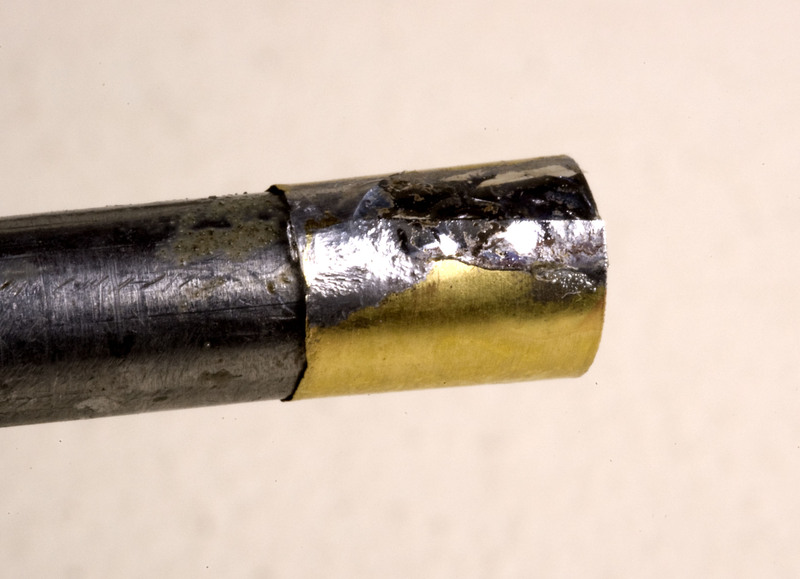 This view shows a close-up of one of the brass contact points and it's solder connection to the conduit wire that transmitted current to the overhead buss wires. 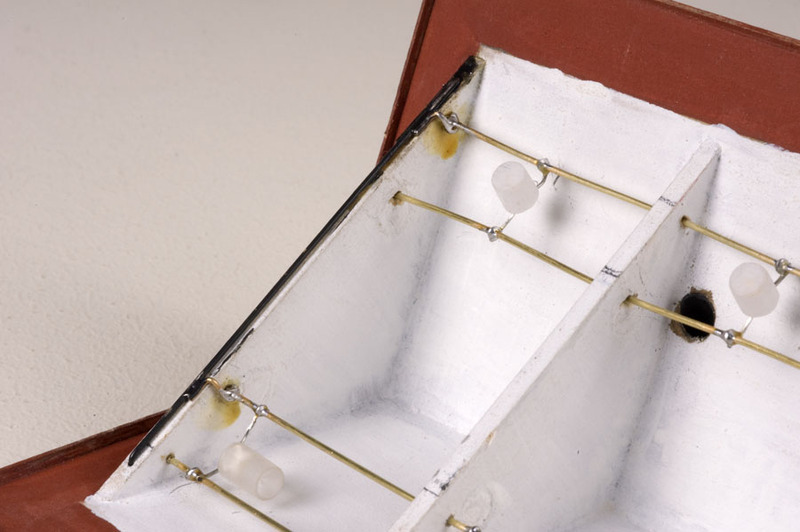 To complete the connection to the removable roof, mating pieces of brass shim stock were soldered to their appropriate overhead buss wires at each end of the roof component. 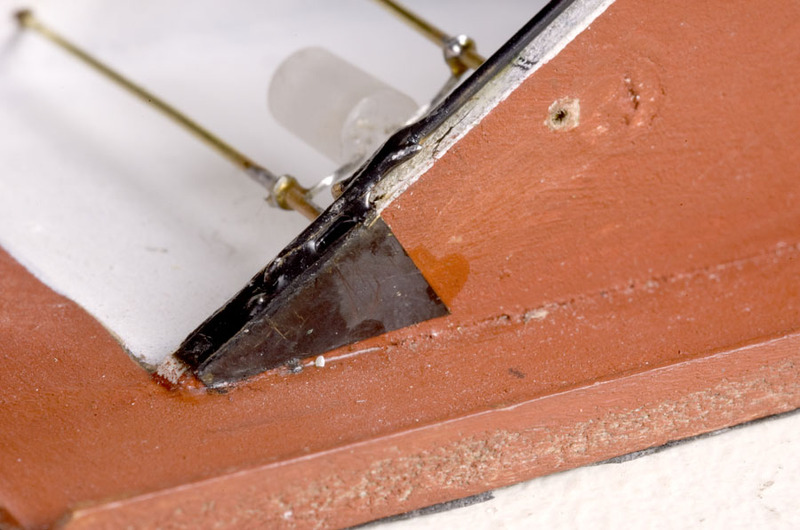 These pieces were then epoxied to the end roof formers, providing a strong bond because the roof would be removed often. These pieces were positioned to allow as much surface-to-surface contact area with their matching pieces installed on the building earlier. 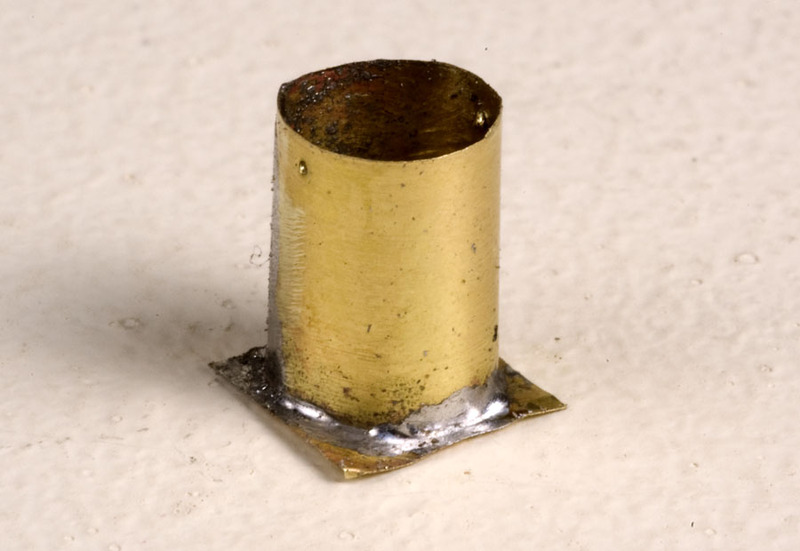 To make the connection to either a 9 volt DC battery or wall wart type of transformer, simple slip on connectors salvaged from an abandoned computer mother board were used. They simply slipped over the ends of the brass wire conduits running down the inside corners of the building. To keep the scene somewhat prototypical, I created a calendar of a 1929 Ford Tri-Motor aircraft using a photo I took of one that came through town on a weekend tour a few years ago. The fact that my ink-jet printer was running out of color ink added to the appearance of a faded out calendar. 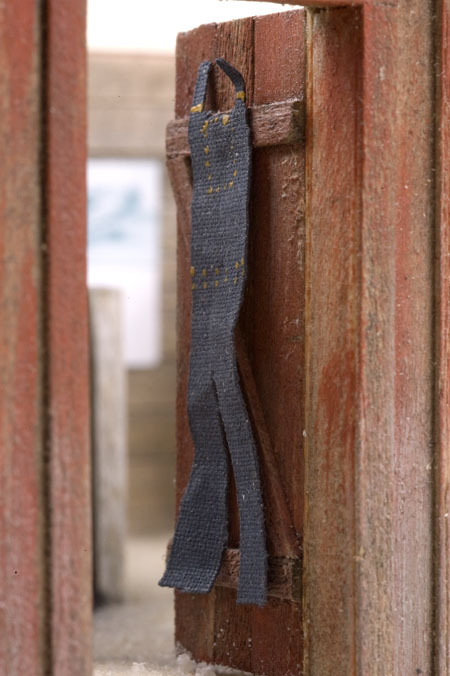 A pair of bibbed-overalls was cut from a pattern I drew on a piece of scrap of blue-jean material. Brass rivets were simulated with dots of mustard colored craft paint. 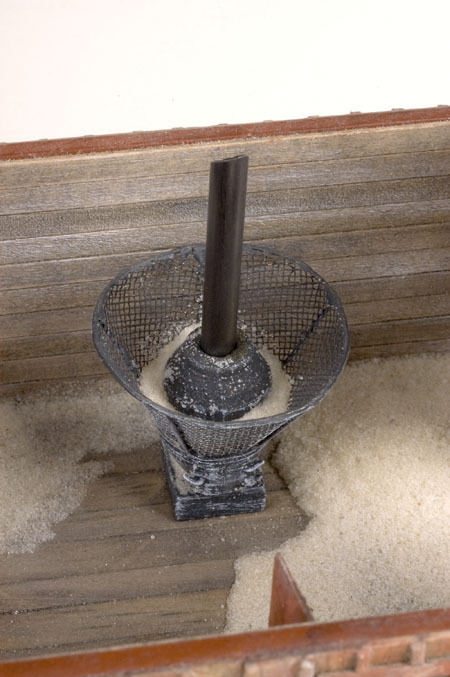 Buckets to carry the sand into the house from the bin when it wasn't shoveled were made using a 1/4" drill, brass shim stock and a short piece of wire. 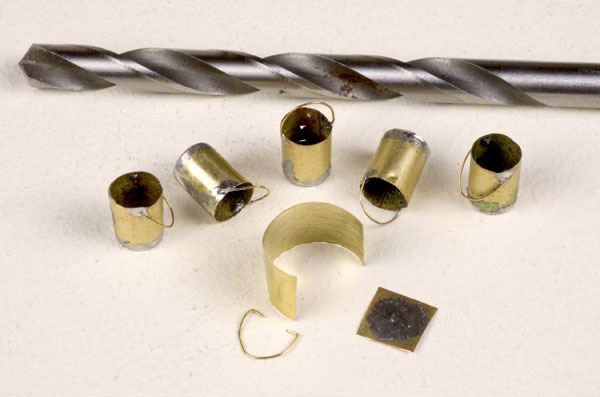 The brass shim stock was cut to approximately 16" tall, then wrapped and soldered around the end of the drill bit. 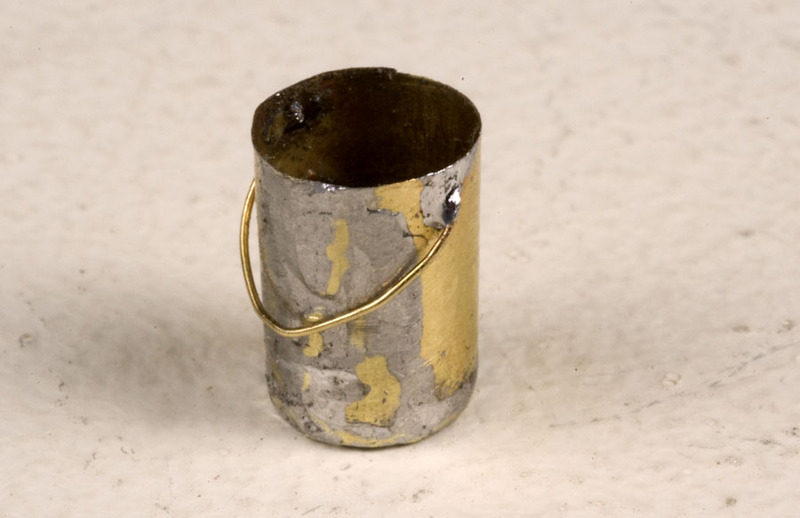 The cylinder of brass was then soldered to a flat piece of brass stock. When cool enough to touch, the excess base was trimmed off and smoothed with a jewelers file. 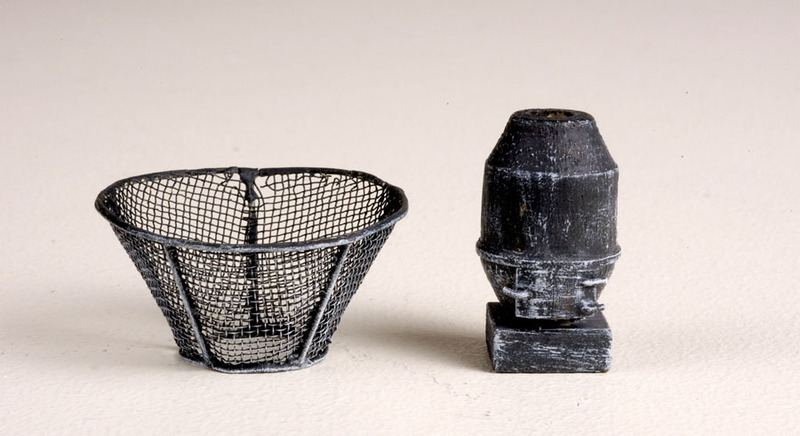 A bail or handle for the bucket was formed from small brass wire and soldered into two holes punched into the upper end of the buckets. 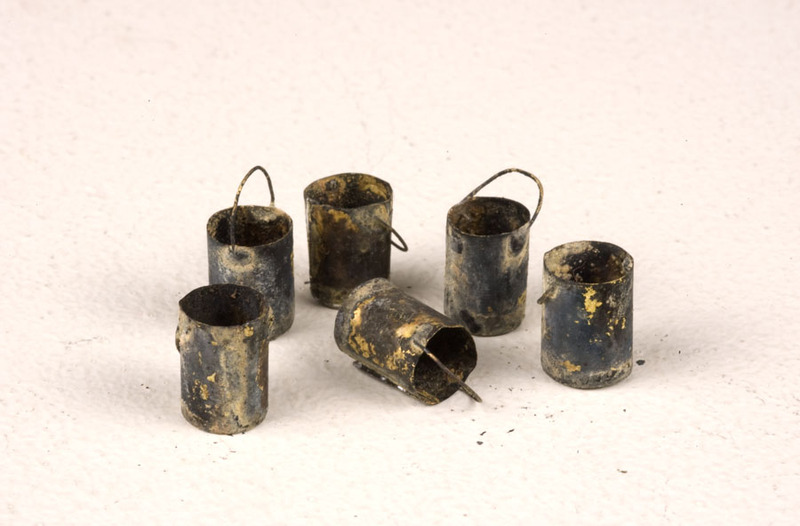 Soldering flux was cleaned off and then the buckets were chemically colored using Radio Shack's PC Board etchant solution to give them the appearance of years of use. 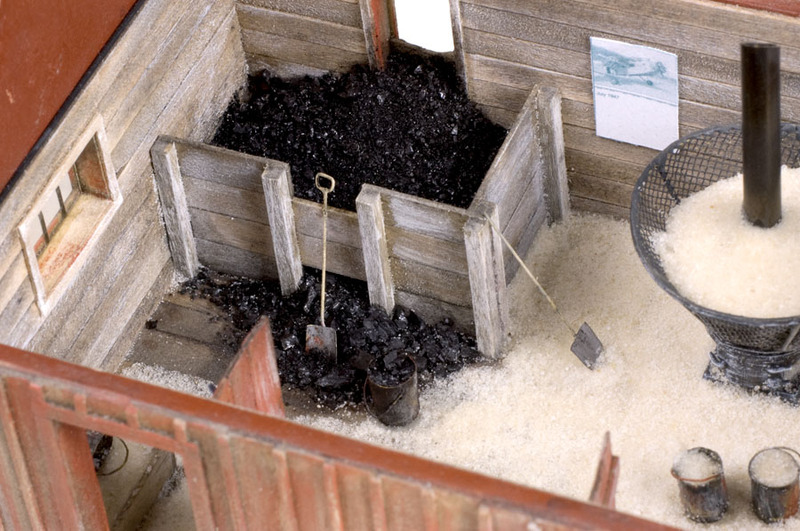 This overhead view shows the coal bin end of the sand house. A few shovels and a bucket of coal are visible along with the faded out calendar. The details to note here are the buckets full of dried sand ready to go out the door for the next engine to leave the sand house area. 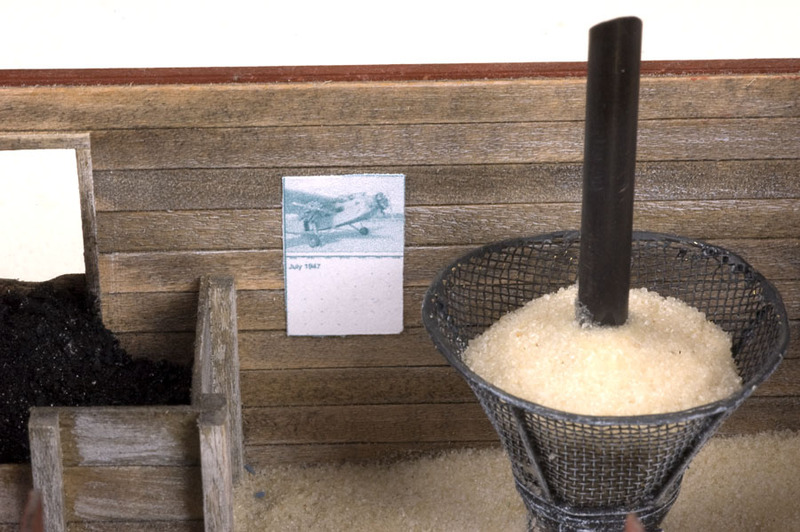 There's also a shovel leaning on the coal bin wall on the left and a long rod that was used to break up clumps of frozen sand that were just shoveled into the drying basket. Also note that additional sand was glued into the basket to reach higher up on the exhaust stack. I hope you enjoyed this description of my venture into O scale modeling. While I would love to have the space for an On3 layout, it's just not possible with my love for Sn3. Anyway, I did have a fun time building this structure.